Vigor representatives approached Vancouver officials “recently,” said City Manager Eric Holmes, one of three officials in Clark County privy to talks with the company as it made its decision. Holmes and Vigor officials discounted the influence of financial incentives in the company’s decision. The city manager said Vigor received the same incentives that would be offered to any prospective industrial recruit, such as a cap on building permit fees and expedited permit processing. Also, the city would assist Vigor in trying to obtain the necessary approvals to build a dock in the future, Holmes said. A Vigor spokeswoman said the company would seek an unspecified amount from Washington’s Economic Development Strategic Reserve Account to assist with the expenses of moving work to Vancouver. Vigor, which is privately held with a mix of 2,300 union and non-union workers, has employees in several locations, including an existing site in Vancouver, its Portland headquarters and a 60-acre shipyard on Swan Island. The company has previously done business in Oregon as Vigor Industrial LLC and in Washington as Vigor Shipyards Inc.
Operating through its subsidiaries, Vigor builds and repairs ships and provides related vessel maintenance services including painting, blasting and coating. It also builds ocean and inland barges. Customers include cruise lines, ferry systems and oil companies. Kvichak Marine Industries in Ballard laid the groundwork to acquire the huge Army contract in 2012, three years before it was acquired by Vigor, becoming Vigor Kvichak. On Friday, workers were informed their facility would close and its projects would move to Vancouver. The 70 workers affected at Kvichak — it’s named after a river in Alaska — were offered the opportunity to move to the Vancouver location. Also Friday, about 60 of the 500 workers at Vigor’s factory in Clackamas, Ore., were told their aluminum fabrication jobs would move to Vancouver. They, too, were offered the opportunity to follow their job to Vancouver, Foti said. The Vancouver site will begin construction of the Army landing craft prototype this summer. Once the prototype is completed and testing and refinements have occurred, another 36 vessels will be built. In addition to the Army landing craft production, the site will also be used to continue Vigor’s ongoing production of the Combatant Craft Medium for the U.S. Navy as well as for U.S. allies, the Response Boat-Medium for the U.S. Coast Guard and export market, Vigor Fast Interceptor, aluminum fast ferries and commercial workboats. Vigor representatives contacted Vancouver officials at the end of November after learning of a potential site in Columbia Business Park. Foti said Vigor’s existing site in Vancouver, the former Oregon Iron Works nearby on the riverfront at the former World War II-era Kaiser Shipyards, did not meet the needs for the aluminum-fabrication projects. The site at 4400 S.E. Columbia Way in the Columbia Business Park is the former home of Christensen Yachts. Vigor is in the process of purchasing the site and the transaction is expected to be completed this summer. Foti noted the marine heritage of the Christensen building in Friday’s news release. “We are honored to carry forward the vision begun by (company founder) Dave” Christensen, Foti says in the release. “When I think of his alignment with the Vigor values of Truth, Responsibility, Evolution and Love, it’s Responsibility and Love that shine through. He stayed responsible to what he built, and his Love for the people who built amazing boats here was proven by Dave’s actions many times over. “There’s a sign in the entry that reads, ‘Through these doors walk the finest boat builders in the world.’ The craftspeople of Vigor intend to honor that vision as we walk through those same doors every day,” Foti said. Christensen died Oct. 15, 2018, years after having any connection with his namesake company, which has been embroiled in a lawsuit between members of the Christensen family and the company’s current owner, Tennessee investor Henry Luken. The parties reached a settlement earlier this week, according to court records, although the details of the settlement were not available. Luken said on Friday that the Christensen Yachts business will continue at a new shipyard location near Tellico Lake, Tenn. Plans for the Tennessee facility were first announced in 2006, but according to a 2011 Columbian story, the company was hit hard by the recession starting in 2008 and had to halt construction of the second location. It never opened, Luken said, but he now plans to finish the site and move the company’s equipment over from the Vancouver shipyard. Best remembered for the Kaiser Shipyards, Vancouver’s Columbia riverfront has a long maritime history. The World War II-era operation was one of the defining institutions in Vancouver’s history, spawning a huge population and housing boom. The yard was along the Columbia River, just downstream from Marine Park; the old slipways are visible from an observation tower near the park’s boat launch. Kaiser produced baby flattops, tank landing craft and Liberty ships. At its peak in December 1944, it employed 38,000 and led to creation of the Vancouver Housing Authority and such developments as McLoughlin Heights, Fruit Valley and Fourth Plain Village. The WWII deal between the U.S. Maritime Commission and the Kaiser Co., a heavy-construction firm controlled by Henry Kaiser and his son Edgar, was signed Jan. 9, 1942. The first ship, the S.S. George Vancouver, was launched on July 4, 1942. The last ship was outfitted in May 1946. Vancouver had been the site of a World War I shipyard as well, called the Standifer Shipyard, at what is now the Port of Vancouver’s Terminal 1. That shipyard went out of business by 1921. Today the site is home to a restaurant, WareHouse ’23. A company Vigor acquired, Oregon Iron Works, also took on marine projects in Vancouver. In 2002, Oregon Iron Works helped build an 85-foot Coast Guard craft under a $2.4 million subcontract. The Columbia River Economic Development Council kicked off the new year by welcoming three members to its board of directors, along with the economic development organization’s new president, Jennifer Baker. Baker most recently served as the deputy district director for the Portland office of the U.S. Small Business Administration, and previously worked in multiple business and trade fields, including four years as an international trade specialist with the U.S. Department of Commerce. Baker began her tenure Jan. 14, and the new board members were officially voted in at the council’s annual investor event at the ilani casino on Wednesday. Alan Hwang of ACH Marketing, Andy Lowery of RealWear, Kara Fox-LaRose of ilani and Tim Price of Yaculta were elected to three-year terms on the board. The council’s board officers are: chair (2018-2019): Casey Wyckoff, LSW Architects; vice chair (2018-2019): Lisa Lowe, Schwabe Williamson & Wyatt; immediate past chair (2018-2019): Greg Seifert, Biggs Insurance Services; treasurer (2019): Lisa Dow, Columbia Bank; secretary (2019): Helen Devery, BergerABAM. The event included a recap of the council’s progress on the Clark County Comprehensive Economic Development Plan, a five-year strategic plan that the organization adopted in 2017, which focuses on three core goals: expand the existing business base, support people and create place. In her closing remarks to CREDC investors, Baker said that 2019 would be a year of increased direct action, and she urged the members to reach out to her and share their stories, as well as reaching out to others in their networks and focus on asking the questions that will spur action. Earlier in the day, The Columbian sat down for an interview with Baker at the council’s downtown Vancouver office to learn more about her plans for the CREDC. Answers have been edited for length and clarity. Coming from the U.S. Small Business Administration, what was appealing about the CREDC and Clark County? What kind of opportunities did you see there? I fully subscribe to the vision of the Clark County Comprehensive Economic Development Plan, and that vision is to recognize Clark County as the most inclusive, healthy an amenity-rich community in the U.S.
Those values and the commitment and investment that I see from community members is palpable in the meetings I attended when I was an SBA employee, and certainly now that I’m president of the CREDC. Being a part of a community that’s so invested allows us to do great things. How much interaction did you have with the CREDC prior to seeking out this role? The CREDC was part of a consortium of partners who were administering a Jobs and Innovation Accelerator Challenge grant several years back, and so I worked with Elizabeth (Scott), who is now our business development director, on the implementation of that grant. What appealed to you about this position, and how will your background contribute to your job performance? I would say that I’m resourceful and diplomatic, and I feel like I have a knack for asking the right kinds of questions to help bring awareness and drive decision making. The experience of having worked with big businesses on international trade issues and businesses as small as a food cart — that expanse of experiences is what I’ll draw on to be particularly creative and resourceful as I liaise with the board and the investor community in realizing the next steps for the economic development plan. One of the things in particular that fuels me is when I can drive by a warehouse or a business that was able to grow by virtue of the help that’s been infused by an organization — in this case, CREDC — and know that there are people employed by virtue of the efforts of the community. That’s very gratifying, to be able to see the results in our community and to know that employment opportunities are being created. Do you see this transition as a continuation of your more recent work with small businesses, or more of a transition back towards the kind of trade and commerce work you did prior to the Small Business Administration, or both? I hope it’ll be both. Well, I know it will be both. Depending on the industry, the SBA defines a small business as anything with 500 employees or fewer. So ‘small’ tends to still be pretty large in the lens of the SBA. I’m not anticipating a huge vacillation, and harkening back to my commerce days, I certainly worked with some very large corporations, helping them with trade policy. Clark County is doing well economically, but like the rest of the Portland region, there have been struggles with housing affordability and struggles for businesses to attract skilled labor. What can the CREDC do to help address these issues, and what are some of the other issues facing the county that you want to be able to play a hand in tackling? Stemming from the CREDC vision, we’ve outlined three business goals. (The first is to) expand the existing business space, and that entails building out traded sector. (The second is) supporting people, so making sure that the Clark County workforce is gaining skills and capacity to be a collaborative partner with industry, and/or attracting workforce from outside of Clark County to bolster workforce where there happen to be specific needs. The third prong of the plan is creating place, and we keep an eye on the lands available for development and coordinate with our city and county partners on that inventory. But another part of creating place is the quality of life factor; being able to reach out and share that Clark county has amazing natural amenities. 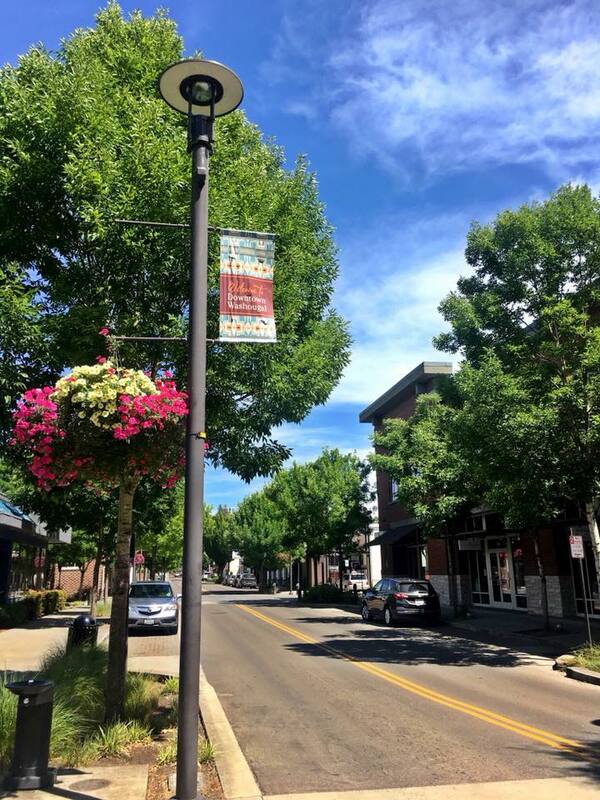 Whether that’s kayaking up in Ridgefield or taking a hike on trails around La Center, or taking a stroll around the Vancouver Waterfront, or walking through Main Street in Camas, or the old historic district in Battle Ground, there are so many amazing amenities that we can share about the quality of life here, and I think that will continue to attract top talent. Clark County has a growing technology sector. What is it going to take to keep it growing and make the county competitive in the tech field? That relates directly to the second two goals of the strategic plan, which are support people — helping to build a workforce that is capable of meeting the needs of the tech industry as they look to move to town — and creating place. Tech industry salaries tend to be higher-end salaries, averaging around $102,000 annually, and oftentimes employees in tech firms want to move somewhere where they can work hard and play hard, and here you have a fusion of both. The diversity of towns that are relatively proximal means that you can have employees who live in different towns depending on whether or not they really subscribe to an urban experience or if they want to have a wooded lot somewhere. As you said, there are different cities here that are very diverse and the county overall has a lot of variation to it — so how do you balance the competing business interests? How do you find solutions that are going to fit with everybody in Clark County? I think that really correlates back to the cities and their uniqueness. Each city has something distinct to offer that makes Clark County desirable and accessible and inviting. So I think in some ways it’s up to those who are exploring Clark County to see what really fits with their life philosophy, because I think we really offer a little bit of it all. The CREDC has been very public about wanting to move forward on replacing the Interstate 5 Bridge. What role do you see the CREDC playing in trying to pick those discussions back up, and how can we avoid another stalemate? CREDC has set up an I-5 corridor task force and we’re inviting city representatives, Port (of Vancouver) representatives and regional transportation representatives to the table. (A new bridge) really will help connect Clark County to the rest of the West Coast more fluidly, and Clark County internationally. We’re pleased that Gov. Jay Inslee proposed a $17.5 million budget line item for an I-5 project office. Coalescing the voices of the business industry and emphasizing the importance of transportation infrastructure to traded sector will help inform the dialogs to come. I think we have a huge commitment on behalf of interested parties to help share our story and help share the benefits of an optimized I-5 project. Are there any other large-scale projects that the business community or the CREDC see Clark County as needing right now? Investment in people is one of the key investments. I know I’m transitioning from infrastructure to workforce, but one of the common themes we hear from business owners in Clark County is that they’re really having to be effortful to find the right workforce contributors to grow their businesses, so I think continued investment in skilled labor and STEM — those will all be important ingredients to building out the most competitive economy. Is there anything else you’d like to say about the job, or to introduce yourself to residents and business owners in Clark County? The community has been very welcoming so far, and I’m so excited to be out and about and hearing people’s stories; their experiences building a business or resourcing business components or trying to explore new markets and troubleshoot parts of the supply chain. I think hearing those stories and being able to translate them into opportunity for other businesses and for businesses outside of the community will be really valuable. VANCOUVER, Wash. (January 24, 2019) – Yesterday, at its annual investor meeting, the Columbia River Economic Development Council (CREDC) elected their new members to serve on the 2019 Board of Directors. At a special Board meeting immediately following, the new Board moved to elect its 2019 officers and private sector Executive Committee members. 1 . Brian Wolfe, Brian H. Wolfe, P.C. 3. Bill Dudley, Landerholm, P.S. 4. Kevin Tapani, Tapani Inc. The full list of the 2019 CREDC Board of Directors can be found HERE. VANCOUVER, Wash. (December 13, 2018) – Today, Governor Jay Inslee released details of his 2019-2021 budget proposal, which includes $17.5 million in funding to establish an I-5 bridge project office tasked with helping define a new project scope, evaluate the previous Record of Decision and re-establish vital partnerships that will lay the groundwork to ensure long-term success. With a growing population and a rising number of businesses seeking to expand and locate in Southwest Washington, the Columbia River Economic Development Council (CREDC) is mobilizing its network of more than 200 business leaders and strategic partners to support a bridge project that provides a long-term solution to the mobility needs of Clark County, the metropolitan region and the entire West Coast. To this end, CREDC recently formed the I-5 Bridge Replacement Task Force made up of business and public sector leaders across the County who will contribute the voice of the business community as this critical work moves forward. Aligned with the Clark County Comprehensive Economic Development Plan, CREDC’s vision for the County is to be one of the most inclusive, healthy, and amenity-rich communities in the country. To accomplish this vision, it is critical that our transportation infrastructure accommodate our immediate needs and set us up for success as we continue on a rapidly growing trajectory. The Columbia River Economic Development Council (“CREDC”) is seeking responses to this Request for Proposals (“RFP”) for the purpose of evaluating and selecting a consultant or team of consultants to provide an update to its 2016 Employment Land Study of Clark County, Washington (the “Land Study”). Responses to this RFP will be evaluated by a selection committee who will independently score each proposal based on the criteria set forth in this solicitation. Finalists with the highest aggregate score will be considered for interviews. Following interviews, the CREDC anticipates the selection committee will invite a finalist to enter into an agreement with CREDC to update the Land Study consistent with the requirements set forth in this RFP. Composite teams of individuals and/or firms may be formed to bring together the various disciplines necessary to provide the services described in this RFP. Having access to consultants with flexibility and various skill sets provides significant advantages and benefits. Firms of all sizes, depth, and capabilities are encouraged to submit proposals. CREDC is often the first point of contact for traded sector businesses looking to locate or expand in Clark County, Washington. The industrial/office/business park market segment is distinct from the commercial and residential markets. Not only is the price of land per square foot lower than for other segments, but these kind of businesses often have specific needs (e.g., access to rail, utilities, or freeway) and requirements that generally are not transferable from one site to another. While lands may be classified as “available,” environmental conditions, regulations, or infrastructure constraints may reduce the effective size, availability, or affordability of those lands for development. In 2016, CREDC conducted an employment land study that identified employment sites and their varying state of readiness, which is an important baseline to inform policymakers and service providers as they respond to challenges replenishing the inventory of sites that support significant high-impact job density. The study, guided by a project advisory group and a consultant team, framed consensus on key definitions and industry-specific profiles. The study identified a total of 56 employment sites arranged in three tiers based on the estimated time needed to make each site development ready. The project also prepared a detailed development analysis that determined market opportunities and the economic impact for five sites from the inventory. • Update inventory of employment sites: determine site-specific changes to development readiness, sites that should be removed from the inventory due to absorption or zone changes, and identify any new sites that should be added to the inventory within the tier structure. • Quantify the total supply and readiness of large industry, business park, and office-industrial (excluding commercial) sites in Clark County, Washington. • Analyze development of identified sites and update their tier rating (e.g., determine Tier III sites that have been developed, and former Tier I sites that have increased development readiness). Report on jurisdictions’ initiatives to advance sites (e.g., capital improvement plans, policy development, etc.) by conducting stakeholder interviews and/or communicating directly with city and county planning and/or public works departments. • Prepare recommendations that detail how sites could be made more attractive with further design, infrastructure investments, or regulatory amendments, as well as how public policy could inform investments to strategically plan and execute in order to yield best and earliest results, increasing the supply of development-ready sites. • Identify strategies for aggregating sites with multiple owners. • Consider sites otherwise development-ready or near development-ready yet located just outside of the Urban Growth Boundary, providing jurisdictions with strategic direction for UGB expansions. • Pinpoint recommendations for highest and best uses for the Chelatchie Railroad. • Provide a final report to inform the discussion on future tools and policies to maintain market-ready inventory of employment sites and provide information that can assist in future infrastructure planning, prioritization, and policy/regulatory rulemaking decisions. analysis for each. Provide cost estimate per site. o Utility gap analysis to determine infrastructure deficiencies surrounding employment sites throughout Clark County, Washington. Funding for this project is expected come from multiple regional partners and the budget will depend on final scope of work and deliverables. Digital delivery of the final report is required and CREDC reserves the sole ownership rights of the deliverables. 5. Total cost including number of hours and hourly rate. A response may not be withdrawn or canceled for a period of 90 days following the submission deadline. Respondents are expected to examine the instructions, specifications, terms, and conditions prior to submitting their response. Failure to do so will be at the respondent’s risk. At CREDC’s request, respondents may be selected for in-person presentations. All responses and related materials become property of CREDC. CREDC reserves the right to reject any or all responses received. Proposals must be submitted electronically to Brittany Bagent at bbagent@credc.org no later than COB on December 7, 2018. If you have any questions, please contact Brittany at the email above no later than November 30, 2018. This application period is now closed. CREDC’s second Grow Clark County event of the year featured a dynamic panel of women founders from across the region who shared stories about their journey starting and growing their businesses in Clark County – including the challenges they faced and what it took to innovate in a fast-changing environment. Allie Magyar, founder and CEO of event management software company Hubb. In just six years, Allie has led the company to achieve impressive regional recognition, including this year’s Technology Association of Oregon's Emerging Company of the Year, Vancouver Business Journal's Innovator of the Year and inclusion in Portland Business Journal's 100 Fastest-Growing Private Companies. Callie Christensen, co-founder of children’s toy company Slumberkins. Along with Kelly Oriard, they co-founded the company in 2015 and have reached great heights, including an appearance on Shark Tank and, most recently, landed a TV deal with The Jim Henson Company. Miriam Kim, co-founder and COO of the leading developer and innovator of connected kitchen products Perfect Company. With 12 years at Intel under her belt, Miriam is a serial entrepreneur who has co-founded two other successful companies: Ensequence and Pure Imagination. Lisa Schauer, president of leadership development firm PointNorth Consulting. A champion of women in leadership roles, Lisa became the first female partner and the first female Board Director at MacKay Sposito and helped found H-RoC Political Action Committee to advance women leaders in Southwest Washington. Below are key pieces of insight from this impressive group of Women Founders, highlighting their motivation, entrepreneurial spirit and advice for others looking to embark on their own entrepreneurial journey. We hope they inspire and motivate you as much as they did us! Special thank you to our sponsors Zenith Properties NW, Kaiser Permanente, iQ Credit Union and Opsahl Dawson for making the event possible and to Schwabe, Williamson & Wyatt Shareholder Lisa Lowe for being a fantastic panel moderator. The next GROW Clark County event is coming up in September. Register for our mailing list here or follow us on facebook, twitter or LinkedIn for more details as soon as they become available.